Miss Edu explains further: all over the country there are women, ladies, girls, wishing, longing, yearning for that shot, that opportunity, that voice, that one chance to pursue what they believe in, with no hindrances, no excuses, no reasons, no holds-barred. But unfortunately, many never get this 'shot', 'opportunity', 'voice' or 'chance', just because they are females. "We are creating the SHOT, the OPPORTUNITY, the VOICE, and the CHANCE for the female gender from Nigeria and beyond , as we groom, make and mould future STARS through the incredible music/talent show, LADY OF SONGS." She also explained that LOS is all about gender equality, which she acknowledged as "one of the United Nations Millennium Development Goals (UNMDG) issues which governments world over are making efforts to attain by 2015. On the modalities of the reality talent/music show, the organizers said it wouldn't be winner- takes- it- all affair since all contestants (no matter who gets evicted at any stage) will leave as winners. Meanwhile, the ultimate winner of LOS will go home with a brand new car, a one year record deal and a sum N3 million, while the runners up as well as other contestants will have reasonable deals and benefits to take home as well. In order to further actualize the essence of this special show, each edition will highlight and celebrate a feminine musical icon. In line with this, the maiden edition is dedicated to the late Lady of Songs, Christy Essien Igbokwe (MFR) for her immense contributions to the Nigerian Music industry. A call for entries will be announced soon for the ladies. Ladies aged 18 to 35 with voices that thrill, in search of the ultimate singer, the LADY OF SONGS! The creator of LOS Olayinka Edu is a Lagos- based events management consultant. A Creative Arts graduate of the University of Lagos (UNILAG) she is also the Founder/President, Women in Distress Association (WIDA) an NGO dedicated to the cause of distressed, abused and less- privileged women. 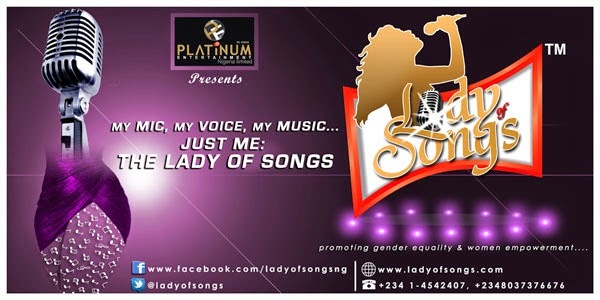 Visit www.ladyofsongs.com for more info. Thumbs up! more is expected! 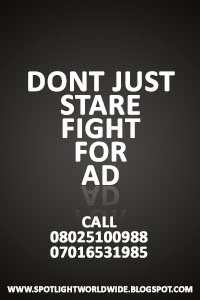 Kudos to the brains behind this.....its lovely! When is the show starting??? !